It is a sign of how things have changed that I received first word that Hillary Clinton is in the race from an email to bloggers which arrived twenty-five minutes before the first “breaking news” alert came in from the mainstream media stating that Hillary’s announcement is posted on her web site. Clinton begins her announcement with “I’m in. And I’m in to win.” While a message promising victory might be what many Democrats are looking for after the frustrations of 2000 and 2004, for me this reinforced the qualms I have about her candidacy. Is this about doing what needs to be done for the country or about personal political power, complete with a return to triangulation and ignoring principles when politically expedient? To be fair the announcement does point out some noble accomplishments and goals, and this is just the beginning as she will be answering questions in a series of web sessions beginning Monday. Still I wish she would have said more about the issue she is most personally identified with–health care. She does ask, “How can we make sure every American has access to adequate health care?” While she asks the question she gives no indication as to how she will go about it. This is an important question in light of her previous health care proposal which was so terrible that it contributed to the Democrats losing control of Congress and prevented any real discussion of change for over a decade. Her approach to health care also makes me wonder about how she will respond to other problems. Thanks to the failure of conservatives once conservatives had complete control of government, liberalism is finally beginning to recover from the branding of “tax and spend” supporters of big government by the right which has done so much harm. If Democrats are again seen as the supporters of such excessive bureaucratic meddling in people’s lives as was seen in Hillary Care, we can look forward to another long period of Republican dominance. Hillary Clinton’s two major rivals at this point in time are two men with limited experience in government. Barack Obama’s meaningful experience is limited to the Illinois legislature while John Edwards used a single undistinguished Senate term as a stepping stone for his first Presidential bid. In contrast, Hillary Clinton’s experience as both a Senator and a First Lady who was involved with policy decisions makes her the most experienced of the three, but the fact remains that she botched not a joke but her first major exercise in national policy, as well as (along with John Edwards) being on the wrong side of the decision to go to war. While Clinton, Obama, and Edwards are dominating the media coverage there is plenty of time for voters to look at other alternatives. Posted in Blogs & Social Media, Health Care, Hillary Clinton, In The News. Tags: Barack Obama, Big Government, Conservatives, Democrats, Health Care, Hillary Clinton, John Edwards. RSS feed for comments on this post.. TrackBack URL. I just got off the phone with my 78 year old Mom in Montana. I do not have the TV on so she told me Hillary was in. She is very excited–her dream is to see a female president and a Democrat in the White House in her lifetime. As for me? There’s something about Hillary that bothers me and I cannot even say exactly what it is. Add my gut feeling to the fact she supported the war. I was in the streets of Seattle protesting the Iraq war before it even started. I knew Pandora’s box would be opened–why couldn’t she see that then or realize it later? Nice post, Ron. Speaking for myself, I’m hoping for one of those “other alternatives”. Janet, I share your vague gut feelings. To the extent that I can articulate mine, it’s something to do with issues of integrity and moral courage, and depth of commitment to change the country. A friend once told me that he’d followed her career since 1970 and had yet to figure out what her center was. I’d add that, whatever Hillary’s center may prove to be, it seems more deeply hidden than ever. Related to the “center” issue, I’m also fed up completely with the Clintonian triangulation M.O. . Another part of my feelings has to due with selflessness. For me, Hillary’s quest feels more like the next career move than a true , deep, heartfelt need to make our country a better place. Not that the latter is absent from Hillary necesssarily: it’s just that it feels to me like the career stuff could be the main thing. She seems to be doing a good job in the Senate. But basically, when I look at Hillary as presidential candidate, and especially when I consider the rather alarming people who seem to be promoting her candidacy and working on this campaign, she seems to me to be all about political-business-as-usual. And that’s not what I want at ALL. Our country is in desperate need of a real leader, who’s in this for the highest and best reasons. Her biggest weakness is her inability to admit a mistake, which was her vote to give authorization to the president to go to war in Iraq. Also, the fact that she is not in favor of setting a deadline to redeploy troops from Iraq. She voted against the Kerry-Feingold resolution to set a deadline to redeploy troops from Iraq. Instead she voted for the “sense of the Senate” weak resolution offered by Sens. Levin and Reed. Will the real Hillary please stand up? I do not want Bubba’s third term. I really liked her in Arkansas where she made big improvements in health care and education in that state. Since she was a Senator, she voted against issues that affect women where she was for them as First Lady. The difference is campaign contributions. If the choice is between a moderate Republican and Hillary (who along with Lieberman represents the Republican wing of the Democratic Party), I may vote for the Republican. The problem isn’t that Hillary is a Repubican but that she doesn’t support the issues which caused me to support the Democratic candidate in 2004. I’ve already mentioning her position on the war (which is more Republican, and which was the opposite of Kerry’s on the actual decision to go to war as opposed to the IWR vote which is greatly misunderstood). Many of Clinton’s ideas are not Republican but are still undesirable. Her health care policies are certainly not Republican, but I would prefer the Republican position of blocking everything as opposed to a plan as bad as her old plan. On social issues, I suspect that deep down she is more socially liberal, but it also appears she will back away from principle whenever politically expedient. If only there were still moderate Republicans left who could win the nomination. Giullani looks like the only moderate on social issues with much of a chance, and he has many negatives including support for the war. If nothing else, just recalling him back at the Republican Hate Fest over Labor Day of 2004 is enough to make it hard for me to vote for him. If only Arnold Vinick from West Wing was real. I’d support him in a minute over Hillary (and possibly over several other Democrats). Even the old talk of amending the Constitution to allow Arnold to run looks like it would improve our choices at this point (plus this would give Democrats the chance to consider Jennifer Granholm). The lefty blogosphere isn’t nearly as concerned with “electability”(which is one of those words that get used a lot, but doesn’t mean all that much) as the NYT thinks it is. Or as the NYT is, maybe. You are going to lose! Hillary is a dumbass! As many others, I am greatly disturbed about Hillary Clinton running for President. Just two days before she announced that she was running she told Matt Lauer of the Today show that she didn’t know if she was going to run but if she did she would let him know. That is a lie. Is she trying to say she didn’t know that she was running two days before she announced? She apparently doesn’t care what people think! 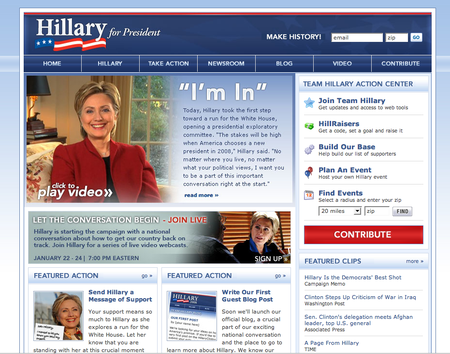 Also now that “her war room croud” immediately went out and tried to discredit Barack Obama lead me to believe that this woman plans to get [down and dirty] real quick in this campaign. That’s what her husband hanging around older Bush has taught them! Bill and Hillary don’t even act like Democrats anymore. Both candidates Obama and Edwards will be far better choices for President and represent the majorit of true progressive Democrats. As a Britain, my problem with Hillary is that she has no idealogical standing. Britain once had a female prime minister, she didn’t say ‘vote for me ’cause I have fallopian tubes’ she said, vote for me because I will do this. Although I don’t agree with many of Thatcher’s policies, she was a real leader. And people respected her, not because she was a woman, but because she did her job. Hillary is the opposite, she never lets us forget that she is a woman, and that women are the only thing that matter to her. I would rather see a real democrat with genuine policies instead of Hillary, with no policies but a funny gimmick to woo the female voters. Women who vote for Hillary because she is a woman, listen: You are being sexist. I didn’t vote for Bush because he was a man, I didn’t vote for Bush because he is an idiot. That’s a common feeling about her. She keeps trying to compromise to the right to gain support. As a result she has lost respect on the left, and the right still hates her. Bubba; just in a different way. Hillary is defining political plaid. Say nothing to make anyone mad hoping to appease everyone. That will not work this year. We are demanding candidates tell us what the beleive because we have toomany years behind us of pure incompetence and pure triangluation. Her discussions about ending the war and health care are defined as “whatever”. If she is so afraid to say what she really beleives then we don’t want her.